Whether you enjoy indoor or outdoor activities, you'll find something to love about the Vacation Time Condominiums. 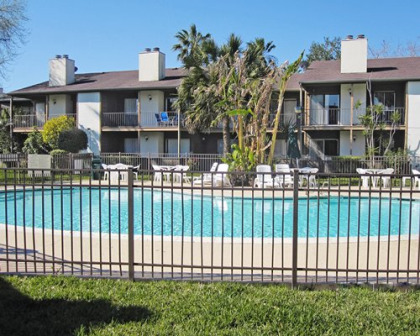 Located in Brownsville, Texas, this resort has a convenient location near downtown that puts you close to all your favorite attractions. While this unique resort gives you the option of renting a property for a short vacation, most visitors find that they love the destination so much that they want to buy a Vacation Time Condominium. Take a look at some of the fabulous options available to you here on BuyaTimeshare.com. Most timeshare resorts around the country offer several unit types, which might confuse you and leave you wondering what you need. To simplify the process, Vacation Time offers two different unit types, but both come with two private bedrooms. The only difference is the number of bathrooms you get. If you don’t like taking turns in the shower or sharing a bathroom with others, you'll love having two in your unit. All units come with amenities like a washer, dryer, refrigerator, coffeemaker, microwave and stove. You'll also have a small, furnished balcony or patio - outdoor spaces which are perfect for relaxing. Less than 30 minutes away from the Vacation Time Condominiums is South Padre Island, which is a popular travel destination. However, you'll find plenty of things to do near this resort. It boasts an outdoor pool and provides guests with access to the Valley International Golf Club, which has tennis courts, a golf course and its own restaurant. There are also museums, historic sites, shopping areas and charter boat companies nearby. Experience a different side of Brownsville and some unique things to do when you buy a Vacation Time Condominium and learn more about this amazing south Texas resort. Contact Vacation Time Condominiums Specialist Today!